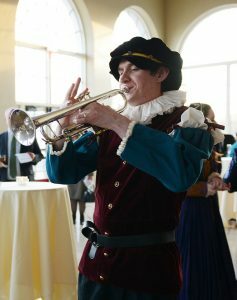 Ross in his natural state: playing trumpet at this year’s Revels Gala! What would it be like to go to a concert and feel like you truly belonged? Like the performers on stage weren’t singing to you, weren’t selling you some experience — but instead to realize that they were singing and dancing along with you? That this show, this experience, couldn’t be happening if you weren’t there? 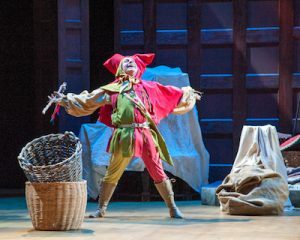 I like to think that The Christmas Revels is such an experience. My family returned to Revels in 2012. 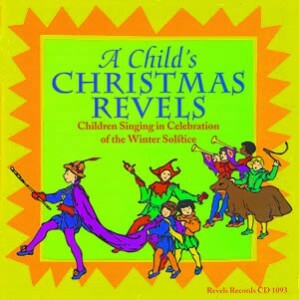 The Christmas Revels had been part of my childhood for as long as I can remember: the famous 1978 medieval Revels record from Revels, Inc. was a staple of the season in our house, along with early holiday music from the Boston Camerata, the Baltimore Consort and, of course, A Child’s Christmas Revels (featuring Washington Revels’ Children’s Chorus). During the 90s, we even made it to several other Revels events: in addition to May Revels at Woodend and Pub Sings in Bethesda, I recall being mesmerized by the 1996 Northlands production. And I remember the last year I went as a child: the Celtic Revels in the early 2000s. Then high school arrived, and for a whole host of reasons the family schedule exploded — the Revels CDs were still spinning each December, but we didn’t make the trip down to Lisner Auditorium anymore. Didn’t make it, that is, until 2012: I had just moved home from my first round of graduate school and someone in the family (I like to link it was me!) came across an ad for the “Ghosts of Haddon Hall” production. The question was circulated: would the family be interested in attending? 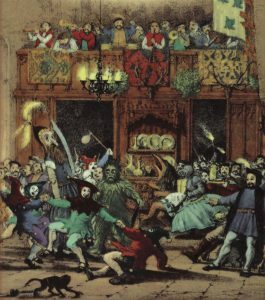 I thought it would be fun to introduce my then-girlfriend (now wife) to The Christmas Revels, so I was a very eager “Yes” vote! We bought our tickets and, a few weeks later, I found myself sitting, program in hand, in Lisner. While I felt a certain fondness for a venue that I hadn’t seen in many years, what struck me most then, and has remained with me since, was the atmosphere of the audience as families arrived and found their seats: yes, there was anticipation and excitement (you might call it holiday cheer) but there was also this palpable warmth, an immediate feeling that everyone in the hall was welcome there. Strangers greeted each other without hesitation, striking up conversations, connected by the shared desire to be part of — and to take part in — the evening’s revelry. Then the lights went down and the performance began. Of all the Christmas Revels themes to “re-enter” with, the 2012 Haddon Hall production may have been pretty close to ideal: a veritable Revels “greatest hits” collection, filled with songs and dramatic readings found on the CDs we’d never stopped listening to, and with familiar personalities like Mark Jaster (who you can see in this year’s Elizabethan show) brightening the stage. Mark Jaster fooling in the 2012 Revels. Yet while these staged elements were certainly familiar and comfortable to us, the real magic was in those moments when the house lights came up just enough to read the program and sing along — when it didn’t matter whether this was your first Christmas Revels or your thirtieth — and you were enveloped by the sound of over 1000 voices all around you! Making these moments even more special was the music itself, and while we sang some familiar carols, it was the selections that you couldn’t hear on the airwaves or in shopping malls — what you might call “Revels favorites” — that were most powerful. Working together to sing a round for peace like “Dona Nobis Pacem” as quietly as possible forged those casual links, formed between audience members chatting before the show, into a unified purpose that meant far more than a simple evening’s holiday entertainment, whether you chose to sing or to listen. Admittedly, it can take my family quite a while to settle on that date… But I hope that you and your family have already picked your show: who knows, maybe we’ll find ourselves casually chatting before the curtain goes up!